NIPPO VINI FANTINI EUROPA OVINI: MARCO CANOLA AND JUAN JOSÈ LOBATO AT THE EUROPEAN CYCLING CHAMPIONSHIP WITH THEIR NATIONAL TEAMS. 2 #OrangeBlue riders in Glasgow for the road race 2018 European Cycling Championships, scheduled for Sunday 12 August. Marco Canola, already selected last year for the World Championships in Bergen, will wear again the Italian jersey. Juan Josè Lobato, protagonist of the victories obtained by the team at the Tour of Qinghai Lake, at the start with the Spanish selection. The European Cycling Championships, the road race competition scheduled in Glasgow on Sunday 12 August, are tinged with #OrangeBlue. 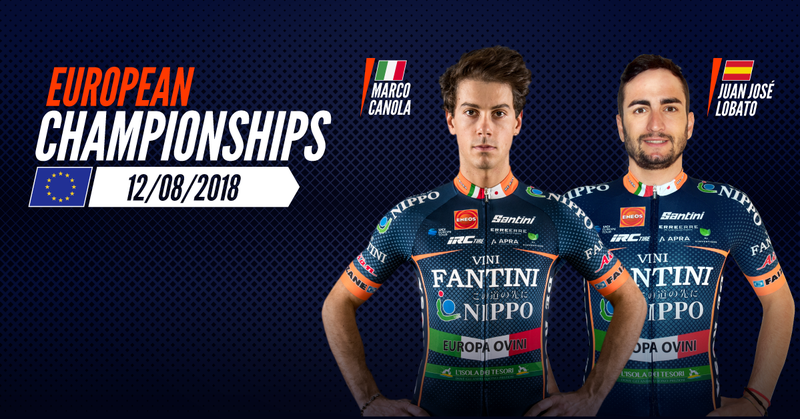 The riders of the NIPPO Vini Fantini Europa Ovini team Marco Canola and Juan Josè Lobato will be on the starting line respectively with the Italian national team and with the Spanish national team, riding for a day representing their countries. An important summons that testifies to the good physical condition demonstrated by the two riders in the last races ride in #OrangeBluejersey and that gratifies them in view of the appointments of the second part of the season. In Glasgow, in the 230km race characterized by an insidious and technical circuit to go 16 times, Marco Canola and Juan Josè Lobato will do their best to become protagonists and to confirm the choice of the technical commissioners to focus on them. Selected by the Spanish national team, Juan Josè Lobato will participate in the upcoming Glasgow European Championships. Returning after the injury, he obtained important results in the last Tour of Qinghai Lake proving to be an excellent team man and a fundamental rider for the victories achieved by his team mate Eduard Grosu. His characteristics and the ability to make himself available to the team led the CT of the Spanish national team to select him for the race scheduled on Sunday 12 of August, testifying how hard work, together with technical skills, still lead to important goals. Satisfied for the summons, he comments with these words the participation in the next European Championships: “Participating in a European Championship with his national team is always something special and extremely important. I am training a lot and I have fully recovered from my injury. The results obtained at Qinghai Lake and the work done for the victories we have gained testify my physical condition. In Glasgow it will be an hard race, but I will try to do my best by putting myself at the complete disposal of the team, which in this case represents my country “. The #Orangeblue leader Marco Canola, already selected last year by the CT Davide Cassani for the Bergen World Championship, will wear the blue jersey at the European Championships in Glasgow. After having watched as a reserve at the last world championships, he will take part in the European Championships, proving to have worked hard to achieve this important goal. The sixth place in the overall standings at the Italian Championships and the physical condition demonstrated in the last appearances with the team, have convinced the CT Davide Cassani to choose him for the national expedition. A special feeling with the national team jersey, demonstrated in the words used by the #OrangeBlue leader: “Dressing the blue shirt on any occasion is always something special, do it in an official race and valuable as the European is something exciting. I am happy that the CT Davide Cassani believed in me and my characteristics. I have trained a lot in the last period to be able to give my best in the second part of the season and in the Glasgow race. The training camp of Livigno has served me to make me ready for a particular race like the one on Sunday “. “A technical stage, rich in curves and treacherous – continues the #OrangeBlue leader – which, with its climb in sequence and traits in pavè, may be uncertain until the end. Rain and humidity will make the circuit even more technical. The team selected by the CT is predisposed to this type of race and will try to do its best to get the victory “. The Glasgow European Cycling Championship will be broadcast live on Sunday 12 of August on the channel Eurosport 1 from 12.15 and on Rai Sport from 12.00. STC PRO Srl p.iva IT01402440117 - Via Lunigiana, 183 - 19125 La Spezia SP, Italia -Rea: SP-126181 - Cap. soc. :10.000,00€ i.v.